We're used to hearing about national recalls. Lead-infested toys from China. Tomatoes that make you rethink the BLT you ordered last night. Baby cribs that might break. It happens all the time. But, heck, it's not supposed to happen to me. It's supposed to be the other guy. This morning, I had the queasy sensation of learning what it's like to finally have purchased a product that has been recalled. I felt something in my pocket and fished out a grocery store receipt, and glanced down and saw the words "Important Recall Notice." LEAN POCKETS SPINACH ARTICHOKE CHICKEN 9 oz. Now, if you're like me, and you've eaten some of these lately, and you haven't heard about the recall, you're probably right now thinking, "What the heck?" So I read a little further, and there was the explanation: Product may contain pieces of plastic. Lovely. Suddenly, I didn't need my morning jolt of caffeine. It had been provided for me. The receipt explained how I could return the product for a full refund at my Kroger store, or people can call Nestle at 1-800-350-5016. In my case, however, I was slightly horrified for a few seconds because I've purchased at least three boxes of the "spinach artichoke chicken," and they're long gone. Then, of course, it hit me that I'm still here. 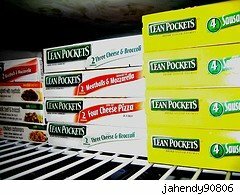 If I ate any plastic, I'm okay, and obviously if you're reading this and have eaten one or some of these Lean Pockets, and you're reading this right now, you're okay, too, right? So there's no need to worry. On the other hand, if you happen to be eating a spinach artichoke chicken Lean Pocket while reading this post, I would recommend you put it down. Now. According to a blog posting on The Boston Herald, there have been three complaints so far, and two injuries. They mention one of them: a chipped tooth. And I swear I'm not making this up -- the first time I had one, I pulled out what I thought was a tiny piece of chicken bone. I was certain that's what it was. Now, I'm not so sure. At the time, though, I was kind of impressed, thinking, Hey, at least I'm eating real chicken. Not that I didn't think it wasn't, but you never know with mass-market processed food. So that about sums up my little anecdote, and maybe I've given a few of you out there a little heartburn or ample warning to get a refund. I'm hoping that this doesn't somehow cause this type of Lean Pockets to no longer be sold -- spinach and artichokes are about the only vegetables that I actually really, really like -- but I admit, the whole episode has given me pause. It may be the first time I've eaten something, only to have the indigestion come about a week later. Geoff Williams is a business journalist--he has a feature that just came out today, about the entrepreneurial ways of 1-800Flower's Jim McCann on Entrepreneur.com. He is also the author of C.C. Pyle's Amazing Foot Race: The True Story of the 1928 Coast-to-Coast Run Across America (Rodale).